DVD to iPad Converter - Convert DVD to iPad video and audio. DVD to iPad Converter, convert DVD to iPad video and audio. 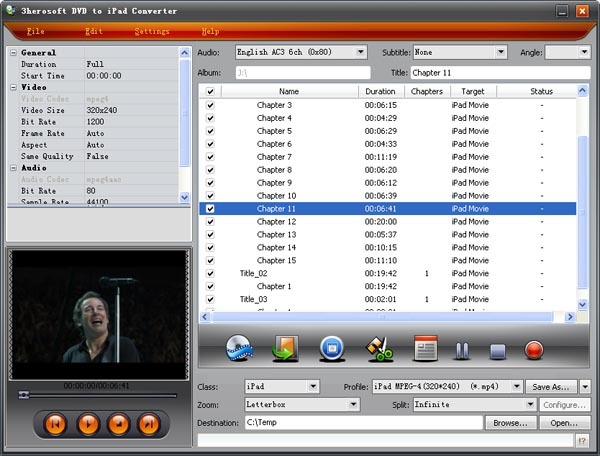 This DVD to iPad Converter helps you convert any selected DVD chapters or titles, and you can also select target subtitle and audio track, adjust bit rate, customize file size, and split file with great ease! Compared with other DVD to iPad converter, powerful and easy-to-use features are significant for 3herosoft DVD to iPad Converter. Whether you are a beginner or a veteran, it will fast offer the best wonderful DVD movie experience on your widescreen iPad. Convert DVD to iPad MPEG-4, MOV video formats to watch DVD movies on your iPad. This DVD to iPad Converter can extract audio from DVD movie and rip it to iPad music MP3, WAV, and M4A. The converted iPad files can be played compatibly on iPad, iPad 2, the new iPad, iPad 4, iPad mini, iPod classic, iPod nano, iPod touch, iPod touch 4, iPhone 3, iPhone 4, iPhone 5, iPhone 5S/5C, iPhone 6/6 Plus and Apple TV. Customizing your own video with video and audio parameters setting including Video Encoder, Resolution, Frame Rate, Video Bit Rate and Audio Encoder, Sample Rate, Channel, etc. Press the "Trim" button, you can get any part of video from DVD by setting the exact time or just drag and set start point and end point to confine when you view it. Choose the audio track, angle and subtitle for your converted video to meet your need. Automatically split a DVD title or chapter into several smaller chunks with suitable Split Mode for choosing. 3herosoft DVD to iPad Converter enables you to convert multiple files at the same time in fast way. User-friendly interface with some simple settings. convert DVD to iPad video and audio with just a few clicks. How to rip DVD to iPad 2 and transfer DVD to iPad 2?